Purple fountain grass – Pennisetum setaceum “Rubrum” is an ornamental landscape grass known for its burgundy or purple leaf blades and soft, fuzzy like flowers. Its foxtail plumes and striking burgundy foliage show up well when surrounded by contrasting plants. This herbaceous perennial grass is heat tolerant and grows well in poor soil. Grow fountain grasses as a hedge, back of a border plant or specimen. Growing the grass is easy requiring little maintenance once established. Pennisetum setaceum “Rubrum” reaches a height of 3′-5′ feet with a 2′ to 4′ feet spread. This ornamental grass typically blooms in July. It’s purplish bloom spikes, succeeded by burgundy or purplish tingled heads, are soft to touch and cry out to be swayed by the autumn breeze. Purple fountain grass is grown in nearly all types of soil. However, it will do exceptionally well in rich and well-drained soil. Plant the fountain grass at any time, however, spring is the best time. The grass will tolerate some light shade though it enjoys the full sunlight. Look for an area in your garden that receives full sun, as the plant prefers warmer conditions. The grass should be given plenty of space in the garden, reaching 4′ feet tall, and spread to 2′ to 4′ feet wide. The ideal spacing is 3′ to 5′ feet. When planting, dig a deep and wide hole large enough to accommodate the roots. Once planted water the grass thoroughly. For those in other lower growing zones true pampas grass – Cortaderia selloana – is an option for those desiring grasses in their landscape. The grass is drought tolerant, however water once or twice a week until plants are established. Give time for the soil to dry to the touch between each watering. In areas that receive rain occasionally and then, you do not need to water the grass that has already established. Although the fountain grass is hardy and grows well even in poor soil, fertilizing will boost its growth. The grass requires additional nutrients when flowering. Flowering is the ideal time to apply a general-purpose slow-release fertilizer. Pennisetum setaceum “Rubrum” produces beautiful blooms with purple foliage. The fountain grass is indigenous to southern Asia and Africa. Considered tender perennial the grass cannot survive cold winters. Pennisetum setaceum “Rubrum” An Annual or Perennial? It is hardy in USDA plant hardiness zone 9 and higher growing as a perennial, although it will grow in zones 7-8 given adequate winter protection. 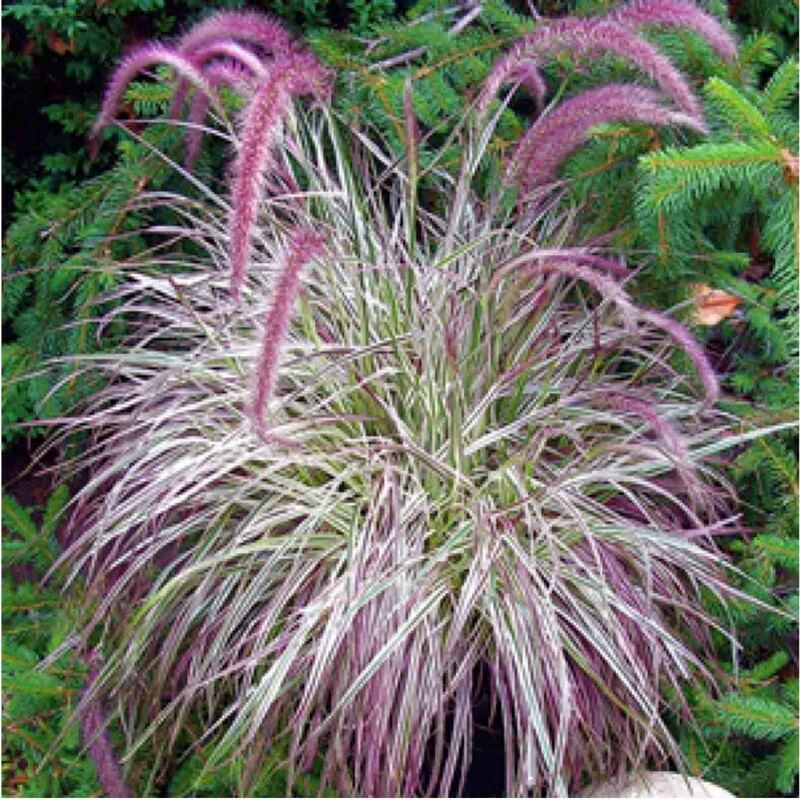 Individuals wanting to grow Pennisetum setaceum “Rubrum” and live in colder climates will have to enjoy its beautiful color and vase-shaped appearance in late summer and fall as an annual. Growing the grass in containers allows overwintering indoors. Water sparingly and never allow the soil in the soil to dry out. Take plants outdoors in the spring. The best time to trim the purple fountain grass is in the early spring or late winter. Although exact timing is not very important, make sure you prune the fountain grass before it starts growing actively. Avoid pruning during the fall as the grass has not yet dried back all the way. Cutting the grass in fall can cause it to go into a growth spurt, making it more venerable to the coming of cold weather. This reduces its chances of surviving the winter. Tie up the dead stems and blades of grass. This will make the cutting exercise easier since cleaning up fallen stems easier. Pruning the grass 4-6 inches above the ground. New growth will quickly hide the stems. Note: Starting the grass from seed is a long process, as seeds take a long time to germinate. The easiest way to start the grass is dividing an already established plant. These divided plants tend to establish faster without problems. One question asked before buying Fountain grass – Is It Toxic to cats and safe for dogs? The ASPCA does not list Pennisetum setaceum “Rubrum” as toxic to dogs or cats. 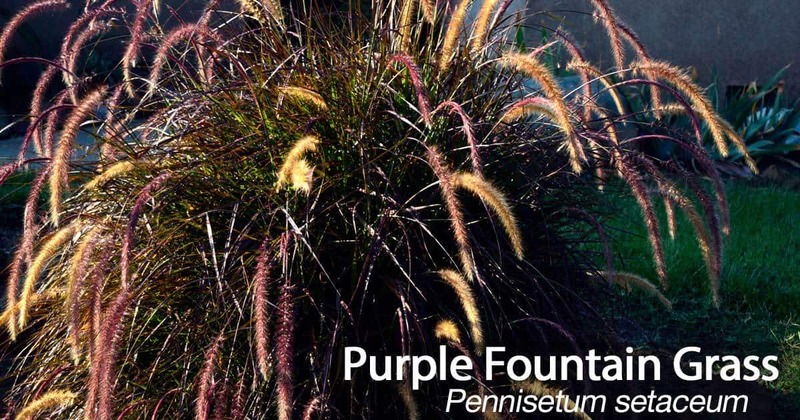 Pest and diseases rarely affect purple fountain grass. Deer usually leave it alone, making it a deer-resistant ornamental grass. The species from which the Pennisetum setaceum “Rubrum” cultivar was developed is considered as an invasive plant. However, this cultivar is not considered invasive. Besides, its autumn seed heads are very attractive like maiden grass, which is very useful in fall arrangements. Cut and dry feathery plumes (seed heads) for flower arrangements.